The Northwest Toronto Service Collaborative is a group of service providers and community memberswho are finding ways to improve services for children, youth and families with mental health and addictions needs in North York and City of York. That is the question that was asked of four members of the Northwest Toronto Service Collaborative’s Youth Advisory Group. These young people have been offering their input into a systems change initiative in North York and City of York called Peer Positive. This initiative is working to support community service providers to engage ‘peers’ as equal partners in the design, delivery, and review of services. Throughout this process we’ve been discussing what it actually means to engage people with lived experience as equal partners in service provision. Here are a few excerpts from responses provided by of our members. To read their complete responses, visit the Service Collaboratives website here. “Individuals with lived experience have an important voice in the development of mental health and addiction systems and services. They can enrich discussions by bringing realistic perspectives about their experiences using services to identify issues and suggest solutions with which they are familiar. “My involvement in systems-level work has led me to realize that youth advisory groups should strive to be critically reflective support networks that challenge the typical ways that systems-level work takes place, and the ways that it can affect mental health users/survivors. 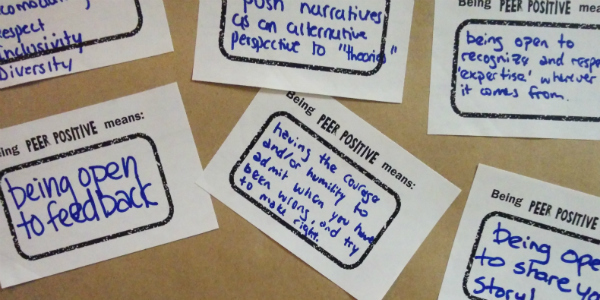 “The value of engaging individuals with lived experience has been noted throughout history. But there is something prohibiting our ability to move forward; perhaps it is fear – fear of losing power, fear of the unknown, fear of knowing you don’t know. “Unfortunately, the balance of the mental health system’s power tips in favor of trained professionals, schooled in medicine and psychology. Service users are often told what is good for them and what they should do, ignoring the individual’s lived experience. What do you think? Do you have any thoughts about how people with lived experience can become engaged at the systems level? Maybe you’ve seen this work in practice? We’d love to hear from you! Leave us a comment below and let’s start the discussion! To find out more about this initiative visit: ServiceCollaboratives.ca or contact Josina Vink (Regional Implementation Coordinator).